27 in. 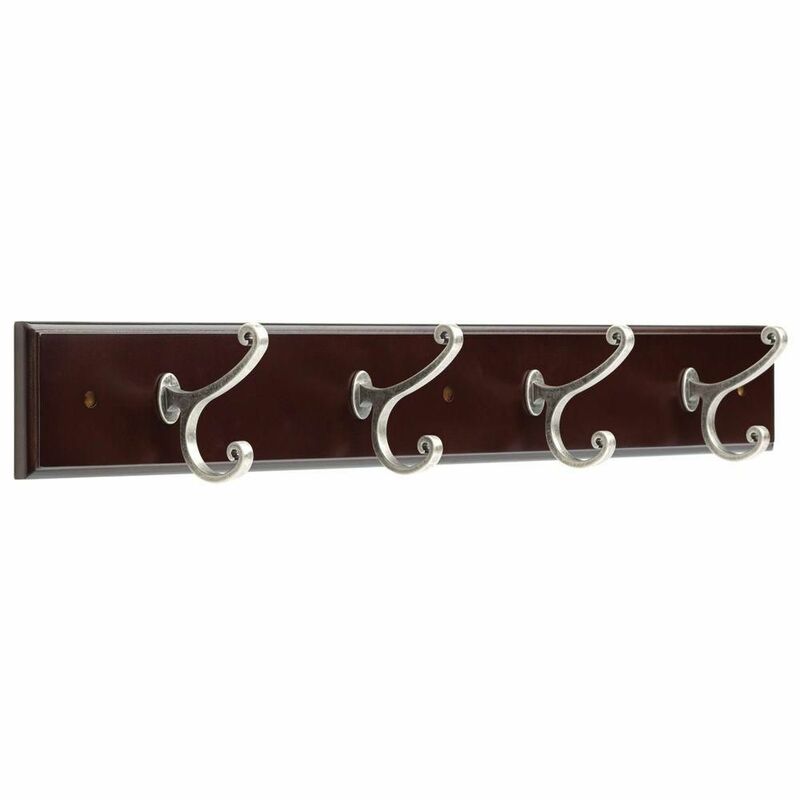 Rail w/4 Casual Scroll Hooks 210 Organization with style has never been so easy. This wood rail with four metal hooks is designed to hold a wide variety of items coats, hats, handbags, umbrellas, towels or robes. This classic design is perfectly suited for any room from the entryway to the bathroom. 27 in. Rail w/4 Casual Scroll Hooks 210 is rated 4.8 out of 5 by 8. Rated 5 out of 5 by Lucia from Very elegant and beautiful in our bathroom. Love it!... Very elegant and beautiful in our bathroom. Love it! Rated 3 out of 5 by Navigator from Would have been great if not damaged. I ordered this on November 30th and it arrived on December 5th. SO FAR SO GOOD. Upon opening the box to my dismay, I realized that this rail has been used previously, has scratch marks on it , and the hardware was thrown loosely in the box. We just finished renovating our bathroom and was looking forward to this hook rail to hung bath towels. First time I've ordered on line from HD. I am so disappointed! It's going back to the store tomorrow. Staff should really inspect before shipping! I've given it a 3 star rating due to the condition upon arrival. Rated 5 out of 5 by Jessicarun45 from As expected Product arrived quickly and as expected. Color was a bit more cherry than espresso but looks good in our space. The drywall anchors are very large, but it was nice that it included the hardware for the price. Rated 5 out of 5 by HKHAN from So far so good... Needed a new coat hook since one of the hooks on my old coat hook broke and couldn't be fixed. This one is working good so far. Looks good and seems sturdy enough. Only time will tell, but hope it lasts many years unlike my old one I got from Target. Rated 5 out of 5 by RRR9503 from Perfect for commercial application It seems to be decent quality and looks great in our tanning room. Rated 5 out of 5 by Venner from Very pleased! Nice finish. Just what I wanted. Arrived promptly. Completely satisfied.